Castle Rising is a small parish dominated by the 12th century castle. Located northeast of King’s Lynn and west of North Wootton the village has a long history, and its importance in the early medieval period is recorded in a nursery rhyme: ‘Rising was a seaport town, where Lynn was but a marsh, Now Lynn is a seaport town, and Rising fears the worse’. The earliest documentary evidence for the village is the Domesday Book that records Rising as a small outlier of the manor of Snettisham that was owned before 1066 by Stigand. The name Rising is of Saxon or Old English origin and has two potential meanings – either ‘settlement of the family or followers of Risa’ or ‘dwellers in the brushwood’. It wasn’t until the medieval period that the Castle prefix was added. Despite the dominance of the village by the castle there is other archaeology in the parish including a fine Norman church and evidence for human activity from the prehistoric period. The earliest archaeological finds date to the Palaeolithic period. An Upper Palaeolithic flint blade (NHER 36624) has been found. Rare Mesolithic microliths (NHER 3334) have also been recovered. The Neolithic axeheads (NHER 3303, 3333 and 14565) found in the parish are more common finds in Norfolk. These flint tools are evidence for human activity in the prehistoric period but it is hard to characterise this evidence. From the Bronze Age, however, several Bronze Age barrows (NHER 3299, 3300 and 11298) have been recorded. These were places of burial. Several Bronze Age copper alloy axes (NHER 3297, 17490 and 41166) have also been recovered, the earliest dating back to the Early Bronze Age. Iron Age finds include two East Anglian Iron Age silver coins (NHER 18148 and 18386) and three beautiful copper alloy and enamel Iron Age terrets (NHER 41166) that were used as fittings on a chariot. More mundane Iron Age pottery fragments (NHER 3302) have also been recovered. In the Roman period we know that the area under the castle was used for agriculture. Roman drainage ditches and field boundaries (NHER 3307) have been excavated here. In other parts of the parish scatters of Roman pottery (NHER 3302, 3303 and 17625) and Roman coins (NHER 3304 and 18386) indicate that there was activity, but there are no clear areas of settlement or occupation. Roman brooches (NHER 3302 and 21067) have also been recovered including one depicting a horse and rider (NHER 3302). There is evidence for Saxon buildings (NHER 3307) on the site of the castle. One of these is a large timber framed bow sided building that may have been an early manorial centre. Alternatively this may have been the site of the Saxon village of Rising that was subsequently moved when the castle was built in the 12th century. 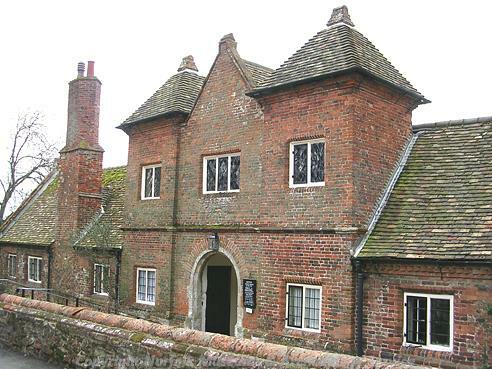 The Saxon mill (NHER 12524) recorded in the Domesday Book may have been on the site of a later post medieval watermill. Activity in the parish during the Saxon period included metalworking – Saxon crucible fragments (NHER 23718) were used to melt copper here. Other Saxon finds including Late Saxon pottery (NHER 24943, 28258 and 28259), a Middle Saxon strap end (NHER 29799) and a Middle or Late Saxon brooch (NHER 29799) have also been found. The importance of Castle Rising in the medieval period has been recorded in the rhyme and there are still many archaeological reminders of its former significance. The castle (NHER 3307) itself was built in the 12th century by the d’Albini family. Later in the period it was inhabited by the ‘she wolf of France’ – Queen Isabella, who was thought to have killed her husband Edward II. The castle had an extensive park and part of the park boundaries (NHER 3345 and 31154) can still be seen. Connected to the importance of the castle was the presence of a 12th century mint (NHER 3306) in the village. When the castle was built d’Albini had to move many of the former buildings and a new planned town (NHER 43122) and the church of St Lawrence (NHER 3309) were constructed and paid for by the family at the same time. 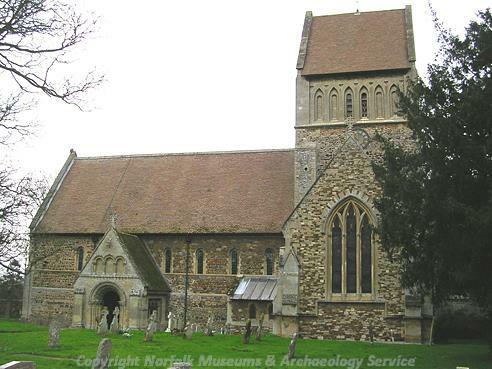 The church remains an excellent example of Norman church architecture with some 13th century remodelling. The village was larger at this time and extended to the north of the present village. 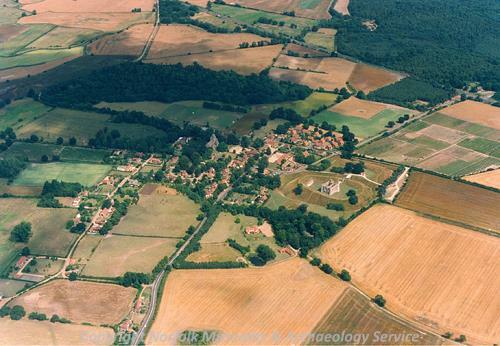 Aerial photographs of agricultural fields show the pattern of the streets and buildings of this shrunken village (NHER 28258) and medieval finds have also been made here. A rare medieval stone cross (NHER 3308) still survives on the present village green where it was thought to have been erected in the 15th century. By the post medieval period the village had declined in importance, and the castle gradually fell into disrepair. Several post medieval buildings survive in the village, including the 17th century cottages at 20 and 21 Low Road (NHER 25336) and the early 17th century almshouse complex (NHER 3311). The 19th century Castle Farm (NHER 25335) stands on the site of the 15th century lodge for the castle. At the 19th century Old Rectory (NHER 3312) human remains found during the building of an extension probably come from the adjacent graveyard. Two post medieval watermills (NHER 3279 and 12524) are recorded in the parish that were used for corn, fulling and paper at various times. Today the village is a well-known tourist attraction. The castle is open to the public. Megan Dennis (NLA), 14th October 2005. Castle Rising History Group. 2010. The Ancient Borough of Castle Rising: from prehistory to the present day. http://www.english-heritage.org.uk/server.php?show=ConProperty.15. 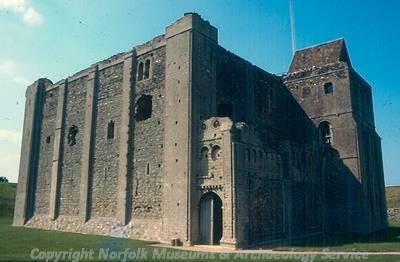 Accessed 15 February 2006.
http://www.roll-of-honour.com/Norfolk/CastleRising.html. Accessed 15 February 2006.
http://www.norfolkmills.co.uk/Watermills/castle-rising.html. Accessed 15 February 2006.